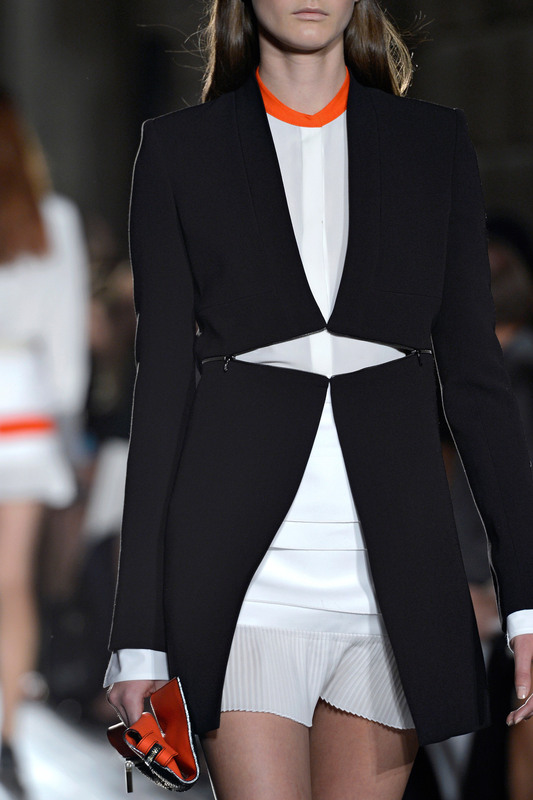 I absolutely adore Victoria Beckham’s collection. She always presents the most beautifully fitted clothes. While renown for the body conscious sheath dress, Victoria Beckham has a decidedly flirty look for Spring 2013. I love the introduction of the ever elegant white cotton blouse to her repertoire. They are chicly paired with gorgeously cut coats and flirty little tennis skirts. Not content to provide classically structured separates alone, Beckham infuses the collection with geometric eyelets and silk lace. The signature sheath dresses are cut to reveal dainty lingerie and fine lace while adorably delicate brassieres appear beneath translucent silk. And I love her take on the perforated trend with the graphic print eyelets making an appearance in intriguing places. I even love deep orange making an appearance amid the generally neutral color palette. It is a beautifully vibrant accent to an already lovely collection. VB, as always, has crafted an innately chic collection of highly desirable pieces. Despite his excellent design technique, I don’t always understand Joseph Altuzarra’s vision. However, I found myself quite enjoying Altuzarra’s embellished take on prêt-à-porter. With his mix of masculine tailoring and distinctly feminine silhouette, he manages to fashion together a collection that feels positively Gatbsy-eque. It captures the nonchalant sort of glamour with the insouciant draping of the smoking jackets and fringe-laden scarves while his jewel-embroidered cocktail dresses are lovely and eye-catching. And I love the idea of a “man’s old-fashioned canvas work-jacket” (Hamish Bowles) being recreated for women in preppy stripped cotton and with a bit of nipping at the waist. They hang over befringed skirts that feel a bit like artfully arranged scarves. Overall, many likable elements to collection. 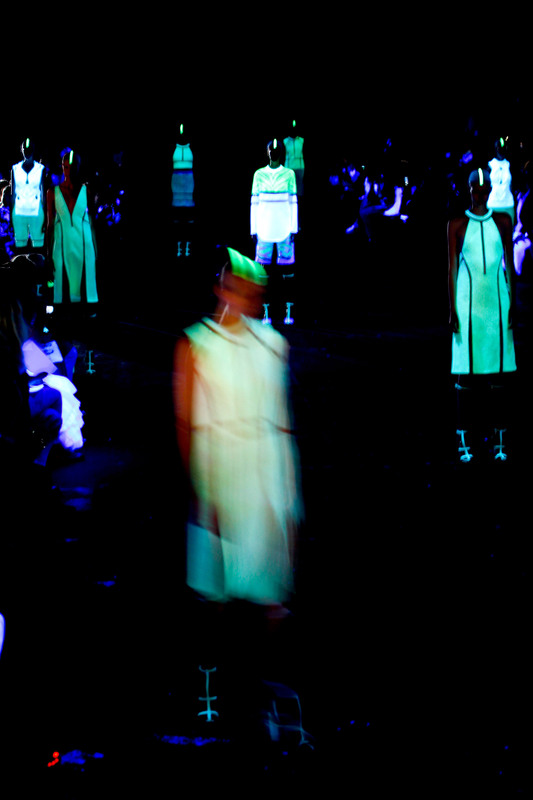 Alexander Wang delivers an intriguing suspended take on deconstruction for Spring 2013. While I still remain partial to his Fall 2012 collection, I found this to be a masterful demonstration of cut and fit. Spring 2013 is both effortlessly modern and cooly innovative. It remains true to the sporty street style makeup inherent to Wang’s style while presenting a slickly tailored shape. Streamlined structure takes on a whole other concept of lightness with the pieces seeming to suspend in the air. I particularly love the use of negative space in this collection. Strips of cotton, python, and leather are cleverly held together with fagoting threads and clear mesh filaments, resulting in a rather alluring illusion. Each piece appears delicate as if it could unravel with the slightest touch, and yet, manages to defy gravity. Moreover, this is a collection of fluid suspension without any sort of romance. Sleek lines dominate with minimal fuss while even overblown woven knit tightly adheres to the torso. The trompe l’oeil layering is elegantly rendered to reveal crisp white cotton or flashes of skin. 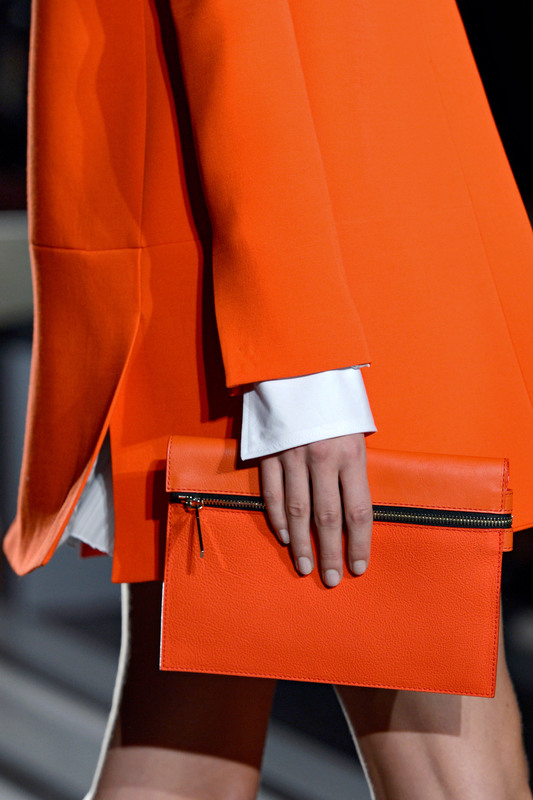 Moreover, a monochromatic palette feels refreshingly on point for spring. This is until we are to treated to the fantastic glow-in-the-dark curtain call. In doing so, Wang is able to meld the wild rave-like element more characteristic of his after parties to this chicly innovative collection. Bravo. Sarah Burton just totally went to town with volume and feathers. And I love it. This collection is fabulously–crazily–dramatic. Soft exploding tiers of organza, chiffon, and feathers are paired with futuristic visors and slick platinum blond wigs. All with heel-less ankle boots made to match. Nothing practical here, but man, what a delightful spectacle. The movement of the pieces is glorious to watch as a 3-D petaled concoctions float by. Absolutely riveting. Moreover, I love the continuation of the theme from Spring 2012. Voluminous scalloped waves call to mind the inside of an oyster surrounding a shiny pearl (or metallic bud in this case). 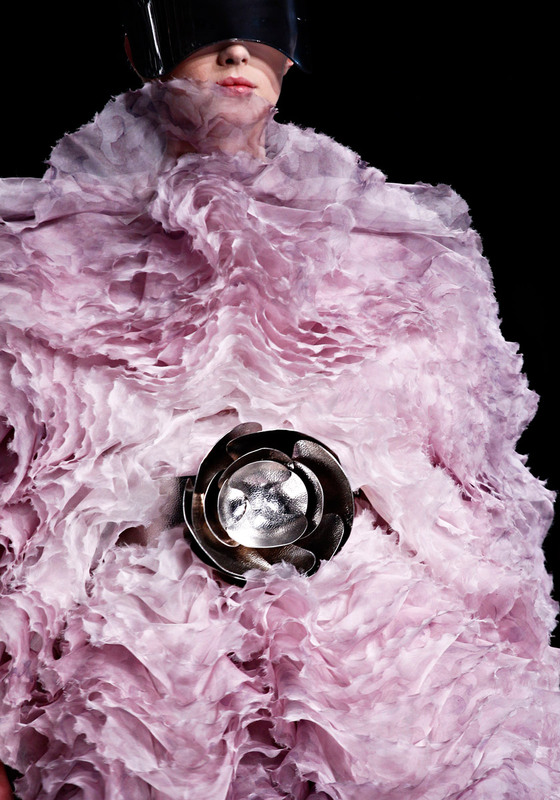 Burton is fantastic at introducing a beautiful femininity to McQueen’s legacy. She has a remarkable ability to infuse drama with light. I highly doubt that anyone but the house of Alexander McQueen could pull off a collection quite like this and make me like it nearly as much. Showmanship and exquisite craftsmanship all rolled into one with this presentation full of lovely frothy blooms. Utter insanity, but one I can definitely get behind. Oh, and the set (as always) is lovely. I adore the eclectic chandelier of naked lightbulbs. Quirky, exposed, and excellently executed. 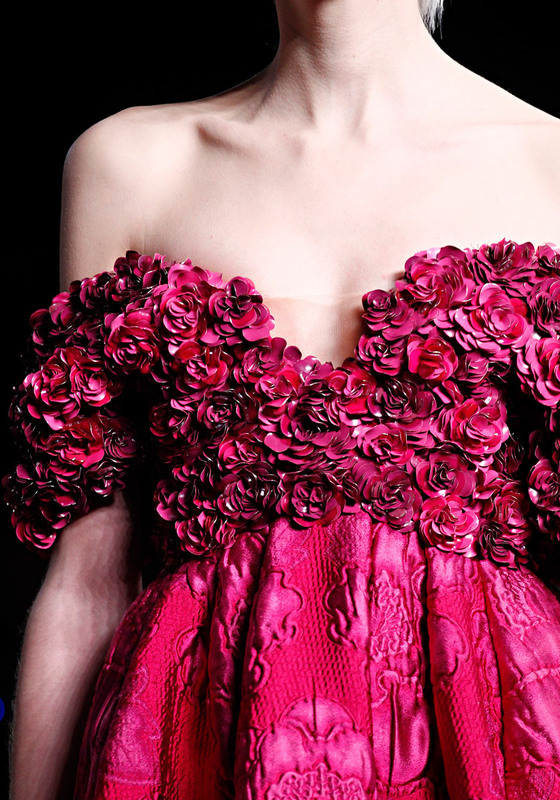 Something quite characteristic of a Alexander McQueen show. I really love what Pierpaolo Piccioli and Maria Grazia Chiuri have done with place. I mean, who else can romanticize black leather? 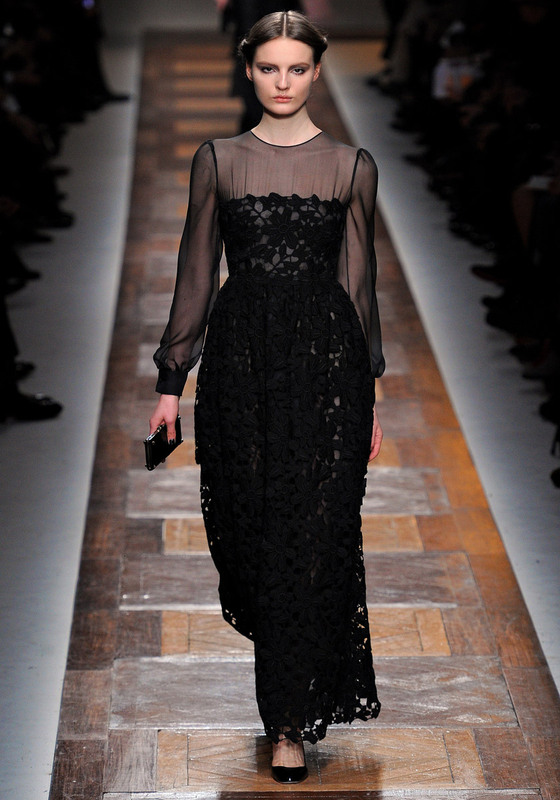 We fall in love with Valentino every season for its heritage, its grandiose other-worldliness. 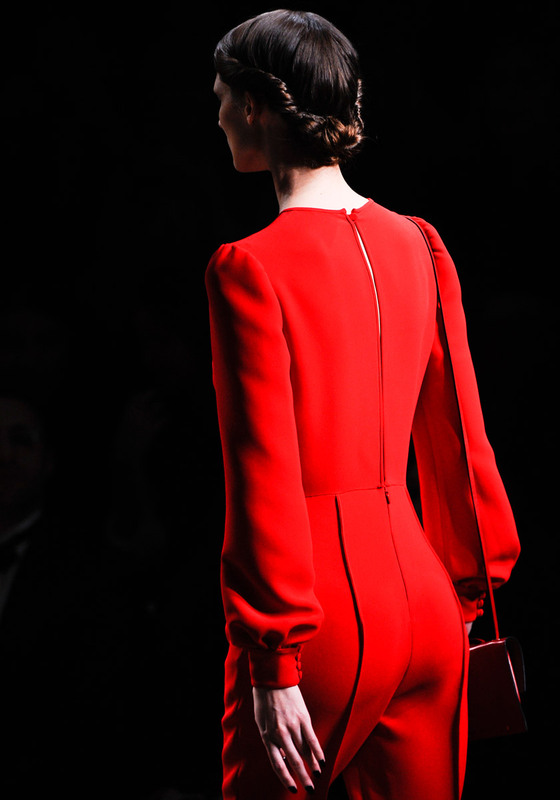 Valentino has always been synonymous with ethereal femininity; it is a house helmed by a masterful couturier. And now that Piccioli and Chiuri have inherited that legacy and are quite good at balancing that historic weight with intriguing modernization. I suspect that I will continue to marvel at this ability for seasons to come, despite them settling in quite nicely for more than a few collections now. Though I tend to associate sleek tailored lines with polished menswear or clean minimalism, Chiuri and Piccioli have rendered supple napa leather and rich silk-wool into a novel fairytale. Not that there is not plenty of filigree lace and silk-macramé detail work in gorgeous cream and of course, Valentino red. With the silhouette kept lean, they are able to showcase high-waisted pinafore and delicate smock dresses without devolving into trite girlishness. This collection feels both current and prettily imagined to introduce Valentino to a whole new set. Though the takeaway look from this collection may be the bright blue lashes, I think Stella McCartney should be lauded for the beautifully put together pieces coming down that runway. 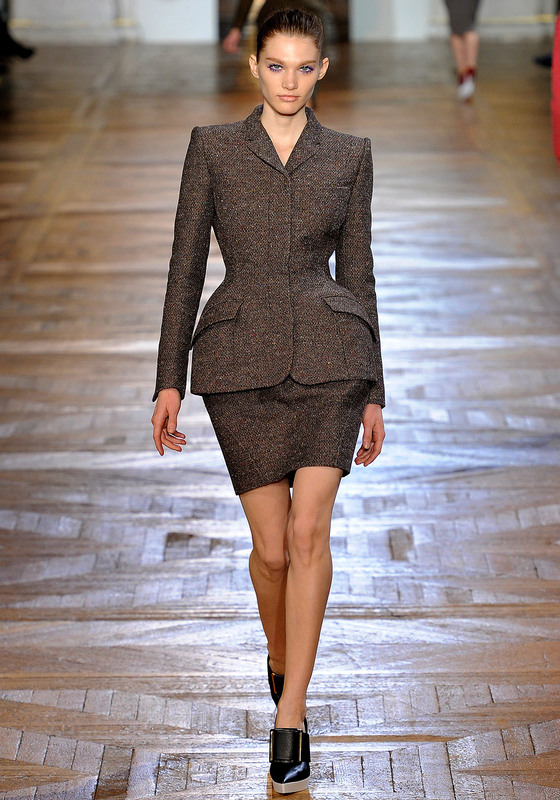 With a polished yet distinctly feminine silhouette, McCartney’s tailoring is on full display. I especially love the color palette with royal blue becoming a delightful staple among tweed brown and clean neutrals. And she provides wonderfully fitting suiting with sporty flare, something McCartney definitely has a knack for. The shape may be simple yet stunningly high impact for some grownup glamour. The textured miniskirts feel flirty without trying too hard while the forties-esque nipping at the waist feels fabulously on point. Moreover, the entire collection is liberally dosed with romantic scroll leaf print embossed onto pieces, adding a baroque-style lavishness to everyday wear. I thoroughly enjoyed this embellished take on an otherwise very grounded collection. Oh, and I adore the contract between the white platform and black leather shoes. So chic! I realize that I am well behind in my reviews on the shows (among other posts), but have no fear! This blog is certainly not abandoned. I will do my best to catch up on it all so bear with me a while longer. On another note, a quick glance at my stat count for today totally shocked me: the number has far exceeded my expectations. I would like to thank you all for your readership. As always, it has been a delightful conversation.